Double Olympic champion in 2004 (500m time trial) and 2012 (sprint), track cyclist Anna Meares is gunning for gold again in Rio. At 32, the Australian boasts a phenomenal record, having conquered a record 11 world titles between 2004 and 2015 (4 in the 500m time trial, 3 in the keirin, 1 in the sprint and 3 in the team sprint). 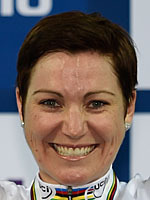 The first woman to go below 33 seconds in the 500m (in 2013), Meares made an astonishing comeback from a terrible accident in 2008, when she broke her neck at the World Cup. The pressure has sometimes taken its toll - and no more so than at London 2012, where she beat home favourite Victoria Pendleton to sprint gold: "At the time, I was tearing my hair out," Meares admits. "It was just super stressful."